Jesus’s people need fantastic stories. We need them like we need food, water, air, love, and above all, Jesus himself. Really? Can we say we “need” fantastic stories? Why not just say “want” or “can use”? To answer, we start with Jesus’s true story, the gospel. As the hero, Jesus lives, dies, and resurrects. He redeems evil enemies to turn them into his supporting cast of worshiper-preacher-adventurers. It’s not only the greatest but the most fantastic story ever told. Clearly, Jesus believes his people need that fantastic (and true) story. But isn’t this gospel enough? Why devote time and thought to man-made stories? 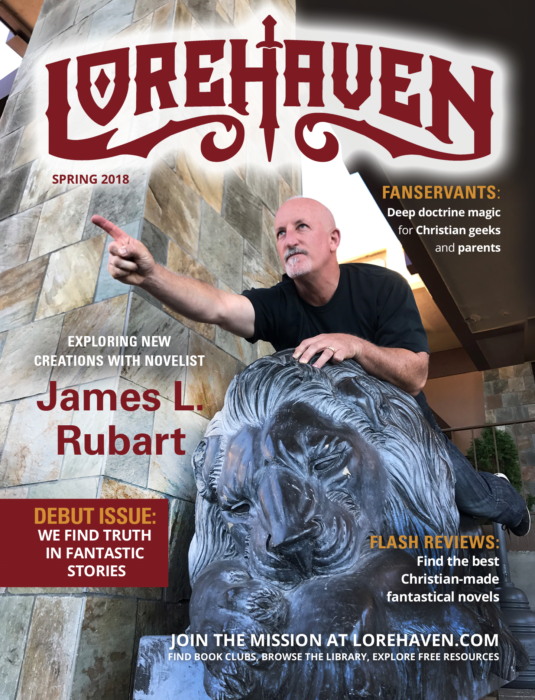 At Lorehaven, we don’t believe human stories are simply “harmless entertainment.” In fact, the gospel itself reveals that God told humans to imitate his creativity (Genesis 1:28). God made our story-making gifts originally good! But stories are also dangerous. Since Genesis 3, we’ve corrupted God’s good gifts. Now, Jesus has saved his church to work and create forever in a redeemed world that he will rule. Until that day, Jesus calls us to recover his purpose for human creativity. That means we must train to explore human stories—as worshipers of God, as his church, and as ambassadors in the world. Many resources already help Christians explore general fantasy fiction. Yet we believe Christians are uniquely able to “shop local.” We can share with one another excellent tales that only Jesus’s people could create. That’s why we’ve launched Lorehaven magazine, with issues every quarter. Inside, flash reviews help you find the best Christian-made fantastic-genre novels. Book clubs help you engage these stories with friends and family in your real life. And encouragement from Christian “fanservants” will help you in this God-glorifying mission: to learn about and love Jesus more, and find his truth in fantastic stories.